The pituitary gland plays an important role in regulating your sexuality and fertility. It synthesizes and releases a broad range of hormones that communicate signals from your brain to your body. Disease and time can break down this communication, according to a July 2008 review in "Aging Research Review." Herbal remedies can stimulate the pituitary gland and reverse hormonal decline. They can, however, also cause side effects. 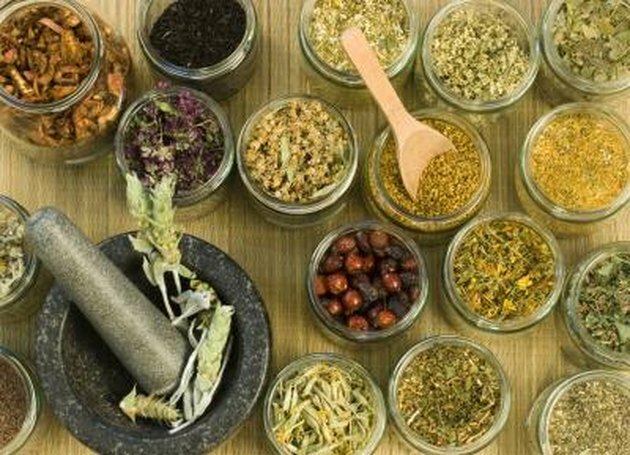 Speak with a physician before ingesting medicinal herbs. Milk vetch, Astragalus membranaceus, is an important herb in Chinese traditional medicine. Ancient healers used this plant to treat a broad range of ailments, according to a February 2003 paper in "Alternative Medicine Review." The mechanisms underlying these effects remain unknown, but milk vetch contains a large amount of flavonoids. An investigation presented in the January 2003 issue of "Archives of Pharmacal Research" looked at the impact of these substances on growth hormone production. The researchers exposed isolated pituitary gland cells -- taken from healthy rats -- to either formononetin or saline. Milk vetch increased growth hormone relative to controls. The extracts did not cause toxicity. The one-seeded sagebrush, Artemisia monosperma, contains many substances with medicinal effects, according to a January 2005 article in "Phytochemistry." Middle-eastern doctors once used Artemisia leaves to induce abortion. These folkloric reports suggest that this herbal remedy affects the endocrine system. A study described in the March 2010 edition of the "Journal of Ethnopharmacology" tested that hypothesis in laboratory animals. Pregnant rats received nightly infusions of either the herb or a placebo for three days. Artemisia extracts increased circulating levels of oxytocin. Sagebrush also delayed the birth process, but neither the mother or fetus showed ill effects from the herb. Lodhra, Symplocos racemosa, grows naturally in India, where it is used to heal wounds and treat menstrual disorders, according to a March 2003 review in "International Journal of Lower Extremity Wounds." The healing properties of this plant likely involve hormones released by the pituitary gland. A paper offered in the September 2004 issue of the "Journal of Ethnopharmacology" evaluated the impact of Symplocos on the pituitary hormones of juvenile rats. Rodents received either the lodhra extracts or an inert treatment during a single testing session. Relative to placebo, the supplement increased follicle-stimulating hormone and luteinizing hormone. Rats given lodhra showed no treatment-related side effects. Traditional cultures used milk thistle, Silybum marianum, both as a medicine and as a food. According to a 2010 review in the "Journal of Pharmacy and Pharmaceutical Sciences," this plant triggers the production of breast milk. The pituitary hormone prolactin probably mediates these results as it plays a critical role in breastfeeding. A study published in the September 2009 edition of "Phytomedicine" tested the effect of Silybum extracts on prolactin in female rodents. Researchers gave the rodents either daily doses of the milk thistle or an inert treatment for two weeks. The herb, relative to placebo, increased levels of the pituitary hormone without causing adverse events. The effects were dose dependent with larger amounts of milk thistle causing greater prolactin release.